When you dash off a press release to the local paper, there’s a lot of factors that affect whether or not it gets picked up for an actual story. Factors such as what else is going on in the news right now, you don’t have any control over. Some factors, like internal politics at the paper, you may not even know about. 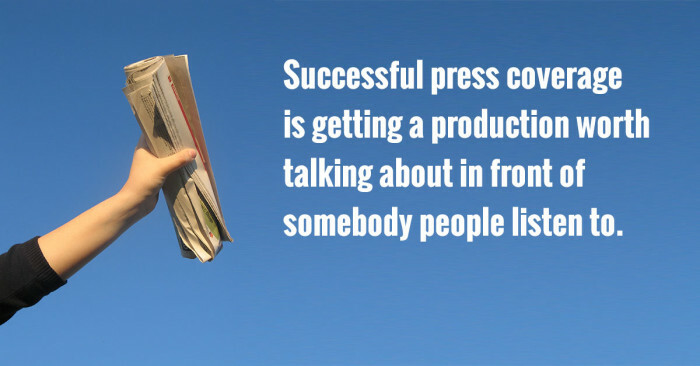 But there are a few things that you can control to give you the best shot of getting press coverage. Two such steps are so important that I wouldn’t expect to get any kind of coverage without them. There’s no way around this. If you just want your town to know that you have a show going on at a particular date and time, then what you’re really looking for is an events calendar. Getting press coverage requires that there be an actual story. The fact that you are putting on a production is not a story. That happens everyday. You need to understand why someone would care that you are doing this production. What elements of the story, the cast, the production values are noteworthy? Specifically you need to understand why the people who consume the news would care about this production, because that’s what you need to emphasize when you reach out to the press. If you’re a bit of a recluse, this probably sounds hard, but I promise it isn’t. Most arts journalists are not hermits. They go out to many local events, and you have the opportunity to meet them if you care to make the effort. You can also cut to the chase and just invite them to lunch. The point is to have conversations with them, though, that do not revolve around (or even touch on in the beginning) asking them for anything. If your first contact with them is inviting them to cover your show, they’ll probably politely turn you down. You can create a dramatically different dynamic when you go out of your way to get to know them. Instead of asking them to cover your show, ask them how they see the local arts landscape. What’s changed in the last 5 years, and what will be different 5 years from now? What do they think the role of arts criticism is? Not only will you be more familiar to them in the future when it comes time to invite them to your show, but you’ll also understand how they approach their work a little better. That means instead of a generic press release, you can approach them with a specific angle about your show that fits in with their take on the local arts scene.